Icebergs can tell a story of their life so far. 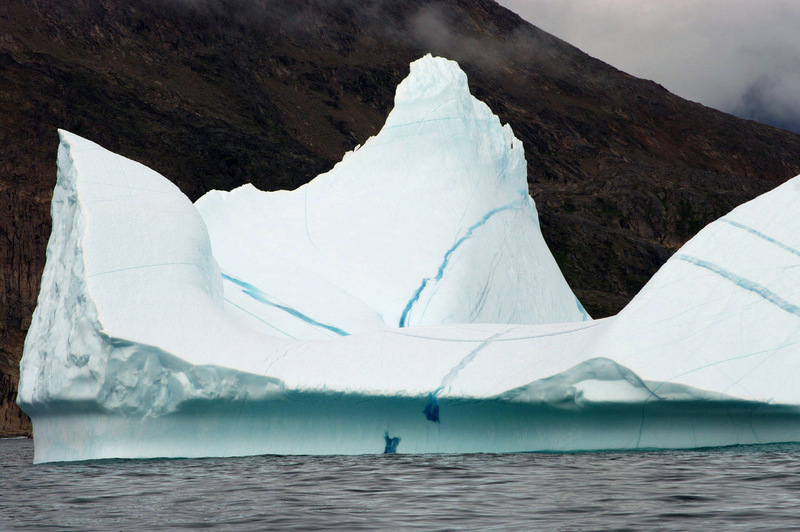 The colour of the ice, the degree of whiteness or blueness gives an indication of how much air there was in the layer of snow that has that colour when the snow fell on the glacier that the iceberg was calved from. The whiter they are the more air, the bluer, the less air. The direction of these thin dark lines however show that they were not laid down as snowfall. Their dark blue colour shows that the water they are frozen from contained no air - i.e. that it was actually liquid water and not snow. So what is the story behind this? As glaciers flow over the underlying rock they sometimes go over a bump which causes a crevasse to form, a crack from the bottom of the glacier to the top. During the summer there can be be some significant melting of the glacier causing water to flow down crevasses and other cracks or simply to fill them with water. The water then freezes and the glacier continues on to the end with the evidence of the water-filled crack literally frozen in time. Photo; � Paul Ward - These are pictures taken while travelling in Eastern Greenland in the Arctic summer.